Tire management and recording systems have come a long way since the days of the old tire pyrometer probe and car chiefs notebook for recording the data. These days tire temperature recording is a function of the onboard telemetry systems, and is recorded in real time as the car races around the track. Tire wear however is still measured by checking tread depth across the width of the tire by measuring depth in the pre-formed depth check cavities molded into the tire at production time. 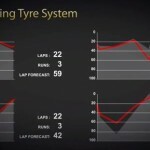 This data is these days collected by sophisticated electronic gauges that interface directly with the tablet based Pirelli Racing Tire System, making the current and historical data available immediately for the team to analyse, and is also transmitted back to Pirelli so that they can collate data from all teams and re-distribute their findings throughout all of the teams. From this co-operative data sharing the teams are able to monitor their tire wear and get a comparison with the other teams standardized data, and from that each team can then use that data to help work out what their tire strategy will be for each race. Just another area in Formula One that has come a long way since the days of mechanical measuring instruments and recording systems consisting of a notepad and pencil.